The .32 bullet, which is actually closer to .31, expanded to nearly .53 caliber. When I was a youngster, our class put on a great play titled "The Mouse that Roared." Perhaps you remember the movie starring Peter Sellers. This blast from the past came to mind as I began looking over a new cartridge. You'll see why as you read on. At the 2002 NRA Annual Meetings in Reno, Nevada, North American Arms and Cor-Bon Ammunition announced a new cartridge that would soon be available for the little NAA Guardian semi-auto. Prior to this time, the stainless steel Guardian had been available chambered for the old .32 ACP round while a slightly larger version took the .380 ACP. The 60-grain Jacketed Hollowpoint penetrated 6 1/4 inches of ballistic gelatin. Putting things in small packages has a downside, of course. It comes as no secret that as barrels are cut down to fit small frames, ballistics suffer. The rule of thumb suggests that 50 fps are lost with each inch of barrel that is removed. By the same token, cartridges that "work," to some degree all rely on a mix that includes substantial velocity. The very best rounds for defensive use tend to hit 1,000 fps or substantially more in many cases. Generating 1,000 fps or more from a sub 3-inch barrel isn't easy. Enter the .32 NAA. As reported by Clair Rees in last November's issue of Handguns in an exclusive story, the new mouse that is making considerable noise hinges on a necked-down .380 ACP that launches a 60-grain .32 caliber bullet at more than 1,200 fps out of a 2 1/2-inch barrel. Much of the developmental work took place under the watchful eye of Ed Sanow, co-author of Handgun Stopping Power, Street Stoppers and Stopping Power, a series of books about real world ballistics. Sanow and Evan Marshall have spent a good portion of their careers looking at cartridges and how they perform on the street. Bottleneck cartridges work well in semi-autos because they are shaped to feed naturally and headspace on the shoulder rather than the case neck. A bottlenecked cartridge can include a solid crimp, eliminating the possibility that a bullet might be dislodged as it is chambered. The .32 NAA is based on a full-length .380 ACP case. Measuring .680 inches in length, the little hot rod features a short neck that is designed to securely hold a 60-grain .32 caliber JHP. Typical of Cor-Bon loads, the .32 NAA round is designed for serious business. Launching a 60-grain JHP bullet, Cor-Bon predicted 1,200 fps and 192 ft-lbs of energy and the combination exceeded Cor-Bon's predictions. Twenty rounds averaged a blistering 1,204-fps with an extreme spread of 69 fps and a standard deviation of 19 fps on the Oehler 35P. The combination accounted for 193.09 ft-lbs of energy. After encountering the gelatin, this recovered 60-grain bullet weighed 46.6 grains with a 3.5-grain fragment. While accuracy isn't often measured with handguns of this size, I managed to hold the little Guardian tight enough to account for five, 5-shot groups that averaged less than two inches at seven yards. With the sights aligned at the top of the target, the NAA/Cor-Bon team stayed within the confines of the 3-inch target most of the time. The combination is impressive in ballistic gelatin, as well. Fired at the routine 10 feet, the little 60-grain slug went exactly where directed and it penetrated the carefully prepared ballistic gelatin 6 1/4 inches. As can be seen in the accompanying photos, the bullet path was straight with a good permanent cavity as well. The recovered bullet weighed 46.6 grains but a 3.5-grain fragment dropped from the bullet as I pulled it from the gelatin. The recovered bullet measures .528 inches or nearly 53 caliber, exhibiting 165 percent expansion. With 72 percent weight retention, the performance is good here as well. I've long appreciated velocity, having taken hundreds of called predators with a .17 centerfire loaded with 20- to 25-grain bullets. Out of a handgun these lightweight bullets can be loaded to just more than 3,400 fps and they'll do more than 4,000 out of a rifle. Typically, they strike like lightning while never exiting the target and doing no pelt damage. Indeed, the magic of the .17 centerfire hinges on velocity. 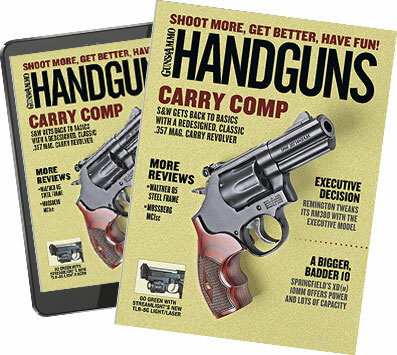 In the handgun world, where backup arms are considered, the new .32 NAA effort of NAA and Cor-Bon looks like a winner. This new hot-rod exceeds 1,200 fps even when limited by the Guardian's stubby 2 1/2-inch barrel. Cor-Bon's hottest +P .380 load can't do 1,000 fps from the same-length barrel. Run-of-the-mill .380 loads tend to generate velocities running from 820 to 870 fps, in similar length barrels. The .32 NAA is based on a .380 ACP case necked down to accept .32 ACP bullets. Featuring limited but adequate penetration and excellent velocity, the .32 NAA looks like a nearly ideal combination for such a small arm. Combined with faultless feeding, I'd bet on this combination.